NEW RECORDINGS to be released this year with Oliver Potratz' This Is Not My Dog / Wanja Slavin's Lotus Eaters / Lydia Daher Band / Seltenes Orchester / Pablo Held's GLOW / Killing Popes and some more. PHILM's 2nd album 'The Madman of Naranam' out on June 12th! HYPERACTIVE KID LIVE-VINYL will be released on february 27th 2015! Philm forges music that bursts forth with unexpected intensity and consequence. Through the band’s insistently sharp, cutting agitation, the music comes more into focus, reaching into the essence, the core, through a process that, with passionate urgency, opens up that core for all to hear. With Philm’s understanding that something only becomes exciting when it is no longer arbitrary, it shifts the boundaries of how we listen. The Berlin-based tenor saxophonist Philipp Gropper is underway with the NYC-based Austrian Elias Stemeseder on piano and synthesizer and the German working class heroes Oliver Steidle on drums and Robert Landfermann on double-bass. Philm use Gropper’s themes as a way of goading the jazz language to its limits, whilst still retaining the structure and style of the classic quartet line-up. All four band members are highly sensitised, lashed to a convoluted framework, but frequently escaping into the unpredictable dark corners of improvisation. "The longer I play music, the more important it becomes and the more clearly I perceive what a band conveys, which message it sends out. This essence, which can be experienced through the transcendant quality of music, is what it is all about, and it is absolutely independent of style or set-up. Sole virtuosity, sole flights of intellect or the elevator-approach bore me - what I want is directness and aura. I am deeply connected to tradition and constantly try to understand and carry forth its liveliness and fire - which could only develop in the context of its time ; and this secure the old masters their lasting impact." TAU works together more like a rock band, the music is mostly developed in a collective process of composing, arranging and improvising. Bringing together their various backgrounds and visions, they are working on their first album. "One of the most exiting German bands of the current century." In september 2013 we will be recording the second album of GLOW. In spring 2012 the first album of Lotus Eaters "For Very Sad and Very Tired" was recorded and will be released on WhyPlayJazz soon. Erste Aufnahmen werden im Juli 2013 eingespielt. Philipp Gropper (tenor saxophone, soprano saxophone, composition) was born in Berlin in 1978. He began to play the saxophone at the age of seven. Gropper studied the jazz saxophone at the UDK Berlin and played with the concert section of Bujazzo for two years under Peter Herbolzheimer. 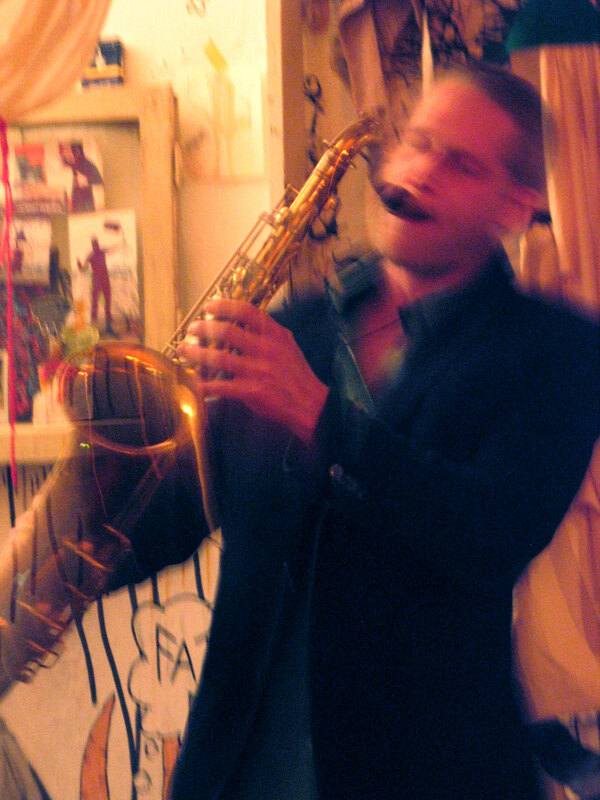 He has since been busy as a freelance sax player and composer, dedicating most of his time to developing his musical ideas. In 2003, he started the trio HYPERACTIVE KID with Ronny Graupe and Christian Lillinger, and in 2012 founded the quartet PHILM with Elias Stemeseder, Robert Landfermann and Oliver Steidle. In 2013 - exploring yet again a completely different field of music - he initiated TAU, an electric acoustic group with Philipp Zoubek, Petter Eldh and Moritz Baumgärtner. Concerts with these bands and others have brought Gropper to over 40 countries across Europe, Africa, Asia, North and South America. He has had the honour of sharing a stage with wonderful musicians such as Rudi Mahal, Ralph Towner, Jim Black, Bobby McFerrin, Kresten Osgood, Tobias Delius, Clayton Thomas, Nasheet Waits, Pablo Held, Olaf Rupp, Ceylan Ertem, Matthias Schriefl, John Schröder, Maria Joao, Paulo Cardoso, James Knapp, Kaja Drachsler, Kit Downes, Dan Nicholls, Günter Baby Sommer, Håvard Wiik, Axel Dörner, Mat Maneri, Matthew Herbert, DJ IllVibe, Ibadet Ramadani, Peter Evans and many others. 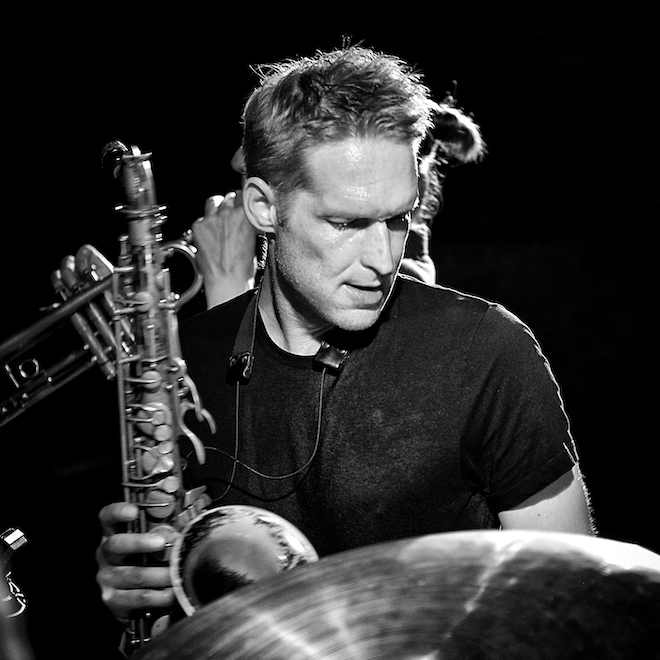 As a sideman he plays with Wanja Slavin's Lotus Eaters, Pablo Held’s Glow, Oli Steidle & The Killing Popes, Home Stretch, European Movement Jazz Orchester and some more. Gropper has recorded more than 40 albums and has been awarded several prizes. 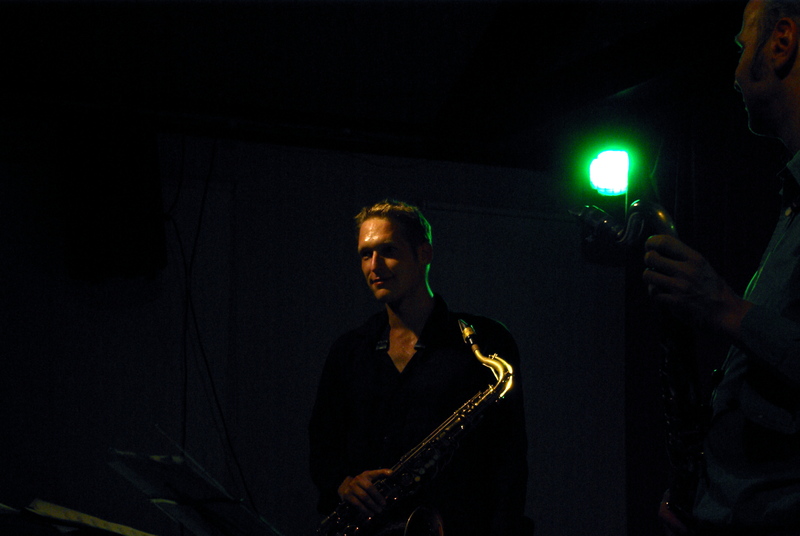 He has been a member of the Jazzkollektiv Berlin since 2009. 2013/2014 he enjoyed an artist's residency in Basel for several months. 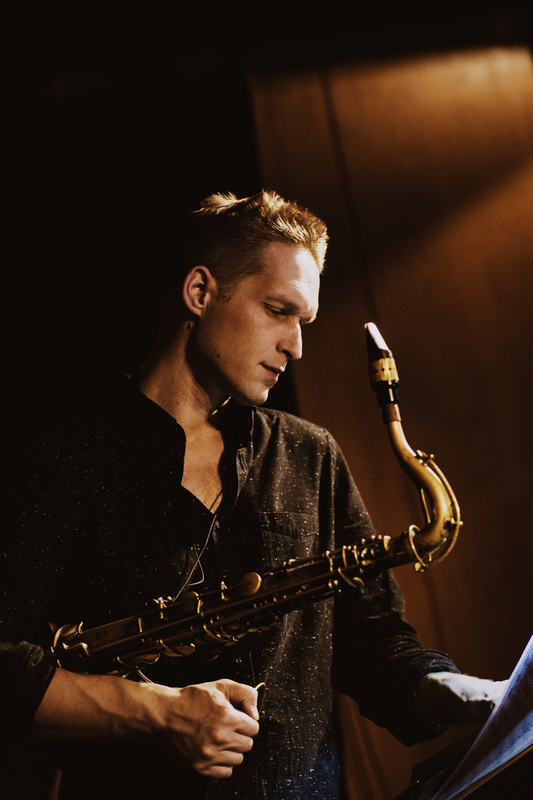 Interview with Philipp Gropper: "It contains and transports everything a musician is..."
Jazz interview with jazz saxophonist Philipp Gropper. Philipp Gropper: – I was born and grew up in (West) Berlin. My parents listened a lot to music and somehow it got me quite early. I remember playing guitar, flute, „drums“ (on cooking pans etc) or piano along recordings as a kid, just listening and trying to find the notes or something that sounded good to me. JBN.S: – What got you interested in picking up the saxophon? PG: – When I was 7, a recording of Charlie Parker made me start playing the Alto. JBN.S: – What teacher or teachers helped you progress to the level of playing you have today? What made you choose the saxophon? PG: – The most important teachers for me were and still are the musicians I play with, the musicians I listen to – live or on recordings. I studied with Peter Weniger, David Friedman and Jerry Granelli at HdK Berlin (university of arts). John Ruocco also was a important teacher for me during my time at BuJazzo with all the beauty he found in melody, rhythm and sound. But mainly and most of the time I was learning as an autodidact. PG: – Well … I try to play and practice what I want to hear and not to play or practice what i don’t want to hear. I need to practice constantly to feel close to the tenor and music. It is a constant, never ending process for me. But I think you have to be very awake and aware with practicing – like with food. Once practiced, it is part of you. Also I think the attitude towards music is equally important and shaping your sound and style as much as practicing is. PG: – I make up exercises every day, mainly practice what comes to my mind. Abstract, but also specific music for bands I play in. Of course also rhythmical things are on my mind a lot. Rhythm has so many aspects. Polyrhythms, layers, relations of time. In the grid and around the grid. Also bigger Rhythms that shape a form etc. PG: – Same goes for harmonies and patterns. There are so many ideas and possibilities. Then also every musical context offers new ideas if you look closely. But I could mention George Russels , John Ruoccos Hexatonics and Classical Composers like Messiaen as big influences in that field. PG: – PG: –Love it or let it be. I think we all have to deal with many obstacles in that business. Egos, the money-ruled aspects of it, a lack of openness, tough travelling etc. So it is important to find ways to deal with these obstacles in order to stay open and free to love sound and music. To me this is the one source that keeps me going. I also accepted the organizing side as part of the creating. If you want to make your band play and create music on stage, you can’t get around it. PG: – Yes. It is kind of a jungle, and I think you simply have to build your own structures. Structures that allow you to make your living and stay flexible and creative. I never thought of the busines-side of music while creating, for me it always works the other way around. PG: – Show them the good stuff! There is so much fantastic, exiting „jazz“ happening. Very often you don`t hear the interesting music in the radio, don’t find the good bands as headliners of festivals, on covers of magazines etc but it exists, a lot of it ! And if you want to keep the tradition of covering popular music then cover actual popular music. That is what they did in their times. The longer I play music, the more important it becomes and the more clearly I perceive what a band conveys, which message it sends out. This essence, which can be experienced through the transcendant quality of music, is what it is all about, and it is absolutely independent of style or set-up. Sole virtuosity, sole flights of intellect or the elevator-approach bore me – what I want is directness and aura. I am deeply connected to tradition and constantly try to understand and carry forth its liveliness and fire – which could only develop in the context of its time ; and this secure the old masters their lasting impact. 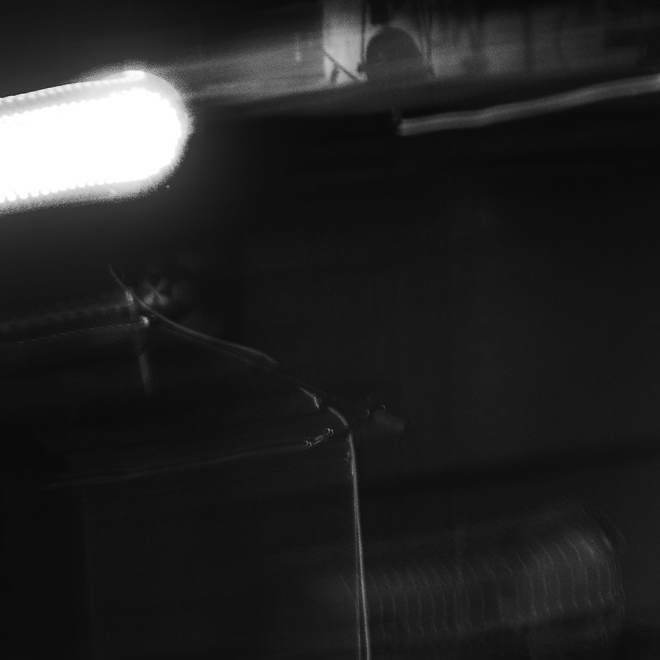 PG: – I understand music as a highly transcendal medium – it contains and transports everything a musician is. Like the aura a person has. PG: – I hope, societies wake up soon and fight the biggest enemy of our times: the neoliberalistic madness. PG: – There are frontiers in all the parameters of music, in beeing a musician, I try to push forward for myself. PG: – Yes. Steve Lacy once said: „the only thing that matters is one thing – is this stuff alive or is it dead.“ My definition of jazz is a very wide one, so I find common ground and similarities in actualy all forms of music. PG: – Many different. Electronic guys like Grisha Lichtenberger, Hip Hop, new music Boulez, Ligeti, always coming back to the old cats but also actual like Peter Evans etc. Düsteres Klang-Kraftwerk. Gespräch mit Philipp Gropper über seine Band Philm, den Berliner Sound und Quellen der Inspiration. 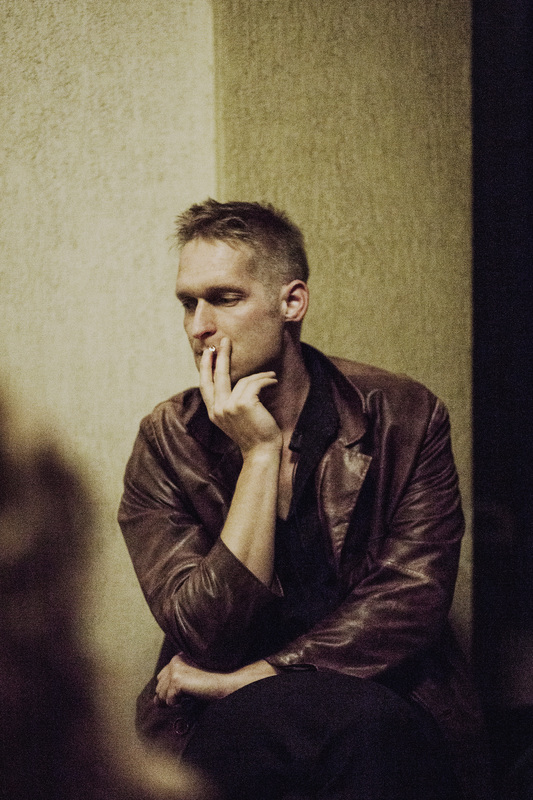 „The Madman of Naranam“ (2015) heißt das aktuelle Album der Jazz-Formation Philm des in Berlin geborenen, inzwischen international tätigen Jazz-Saxophonisten Philipp Gropper. Ich habe ihn auf einen Kaffee in Kreuzberg getroffen. Philms „Madman“ steckt so voll von unterschiedlichen musikalischen Elementen, dass das Hören von mal zu mal interessanter wird. Schon das erste Stück besticht durch komplexe pulsierende Rhythmik, Tempowechsel, eine faszinierende kollektive Interaktion. Es klingt kraftvoll, rau, direkt, intensiv – Was davon ist charakteristisch für die Berliner Jazzszene? Gibt es so etwas wie einen Berliner Sound? Das ist eine gute Frage. Ich glaube, es gab schon mal so was wie den Berliner Sound. Kurz nach dem Mauerfall, in den 90ern und nach der Jahrtausendwende… diese ganzen Leute: Rudi Mahall, Johannes Fink: dieser spröde Sound, irgendwas zwischen Free und Form. Aber inzwischen habe ich das Gefühl, die Szene ist so groß, es gibt so viele verschiedene Szenen, dass man das gar nicht mehr so sagen kann. Es gibt viele Bereiche, in denen relativ intensiv gesucht wird. Eigentlich ist prägend für Berlin, jetzt nicht soundlich, aber von den Umständen, dass es hier noch möglich ist, relativ entspannt zu überleben als Musiker, mit wenig Kosten. Das hat eine große Anziehung und trägt zur Internationalität der Szene bei. Dann all diese Läden, in denen man spielen kann: Sowieso, Greenhouse, Donau 115, West Germany… Aber was musikalisch passiert? Es gibt grade viel improvisierte Musik hier. Letztendlich ist der größte Einfluss – nach den Platten, mit denen man groß geworden ist und den Helden, die man so hat – die Leute, mit denen man spielt. Das sind auch die, von denen man am meisten lernt. Und da gibt es natürlich prägende Gestalten in so einer Szene, so Charaktere wie Tobi Delius oder auch Christian Lillinger, Petter Eldh, Elias Stemeseder. Wer sind die Helden deiner musikalischen Sozialisierung? 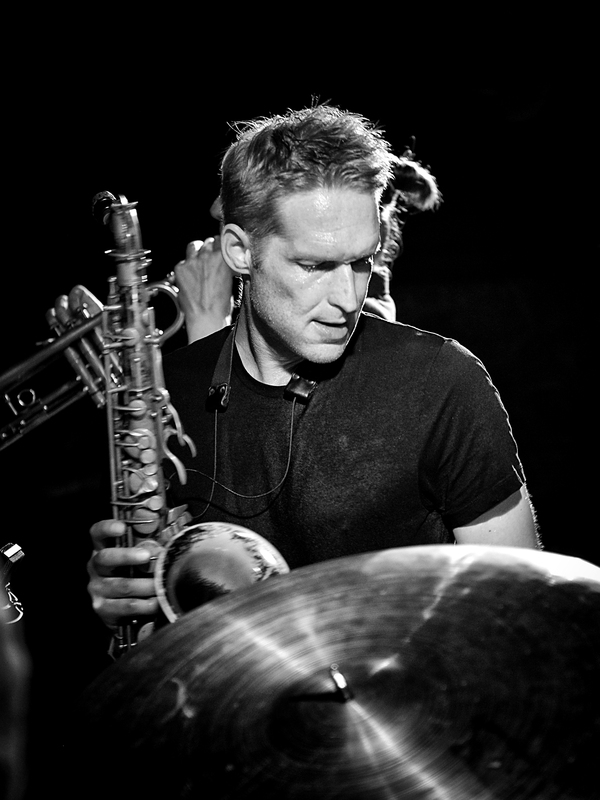 Naja, schon die großen Alten natürlich, also Coltrane, Shorter, Rollins, Parker. Damit ging es los. Ich habe als Kind schon angefangen Jazz zu hören. Aber es wird ständig immer breiter. Ich höre auch elektronische oder klassische Musik, Neue Musik oder Noise oder traditionelle Musik vom Balkan. Die Palette wird immer größer. Es ist natürlich vermessen, dass man irgendwie einen Sound prägen würde, einen Berliner Sound, das ist immer ein kollektiver Prozess. Hyperactive Kid [mit Christian Lillinger und Ronny Graupe, Anm. d. Red.] wurde ja auch immer mal wieder als charakteristisch für den Berliner Stil beschrieben. Ja, stimmt. Es ist natürlich vermessen, dass man irgendwie einen Sound prägen würde, einen Berliner Sound, das ist immer ein kollektiver Prozess. Aber natürlich passiert es, dass es Bands gibt, die in der Wahrnehmung repräsentativ für eine Szene dastehen so wie es zum Beispiel „Der Rote Bereich“ vielleicht mal war für lange Zeit. Hyperactive Kid ist ein Kollektiv, in der Band Philm bist du der Leader. Was ist anders? Der Arbeitsprozess ist sehr vergleichbar mit dem bei Hyper – mit dem Unterschied, dass ich der Einzige bin, der Stücke schreibt. Bei Hyper schreiben alle, dann proben wir und jeder bringt Ideen und Vorschläge. Und an dem Punkt sind wir jetzt auch mit Philm. Das ist es, was für mich wertvoll wird, so eine Arbeit mit einer Band. Die Art und Weise, in der wir uns begegnen als Musiker ist ja nicht so, dass einer eine ganz klare Vorstellung hat: „so und so soll es klingen“ und anderen das erklärt, sondern man sucht die Musiker aus, weil man weiß, die haben einen bestimmten Sound und die können den mit einbringen. Man erwartet ja sogar viel Phantasie und Vorschläge… In dem Ausmaß, dass man sich gerne überraschen lässt und Dinge verwirft, die man vielleicht vorher im Kopf hatte als Komponist oder Bandleader. Das ist auch bei Philm inzwischen ein ganz kollektiver Prozess, weil wir momentan die luxuriöse Situation haben, dass wir viel spielen und proben können. Könnte das vielleicht eine Tendenz sein, dass man intensive Gruppeninteraktion viel mehr wertschätzt? Wie war es in deiner eigenen Entwicklung? Es ist mir auf jeden Fall ein großes Bedürfnis und ein Wunsch und es fehlt mir sehr oft. Die Realität im Jazzalltag sieht so aus, dass jeder, der davon leben möchte, in ganz vielen Bands spielt, die Bands nicht mehr so viele Konzerte spielen oder nicht mehr lange touren, dann gibt es eine, vielleicht zwei Proben mit sehr kompliziertem Material und man spielt ein, zwei Gigs. Die interessante Arbeit fängt aber erst viel später an: wenn man zum Beispiel alles Material auswendig spielen kann. Das ist gar nicht möglich in diesem Wahnsinn: ich kenne viele Leute die in 14-15 Bands spielen. Früher konnten die Leute den Fokus eher auf ein Projekt oder zwei Projekte legen, aber das ist schon jahrzehntelang nicht mehr so, diese Realität hat sich verändert. In der freien Szene sind oft natürlich „first encounters“ gewünscht, die das ganze lebendig halten, aber es gibt auch in dieser Szene Bands und Leute, die jahrelang an den Improvisationen arbeiten. Ich glaube, die meisten Musiker haben ein Bedürfnis danach, mit einer Band tiefer einzutauchen oder einen Sound zu finden. Das ist nur sehr oft einfach nicht möglich. Die Band gibt es schon sehr lange, aber es gab drei andere Pianisten vor Elias. Eigentlich so richtig eine „working band“ ist es erst seit einem Jahr, also für mich, in meinem Gefühl. Das heißt, du würdest auch sagen, von dem ersten Album zum aktuellen hat sich viel verändert? Und wie würdest du das beschreiben? Was zeichnet euren Stil jetzt aus? Gehst du so auch bei der Komposition vor? Dass eine Stimmung, eine Atmosphäre den Ausgangspunkt bildet? Und hängt das mit der Atmosphäre in Berlin zu leben zusammen? Ein bisschen kann man sich ja hineinfühlen in deine Musik als Soundtrack des spätmodernen Großstadtlebens. Wahrscheinlich schon. Die Umgebung, die Zeit – gewollt oder ungewollt – das alles hat Einfluss auf die Musik. Und trotz Globalisierung und Internet und dem Zugang zu allem eigentlich, gibt es immer noch diesen lokalen Sound. Zum Bespiel hat Köln einen bestimmten Sound, immer noch! Wobei natürlich alles ein bisschen vielschichtiger geworden ist. Aber das Lebensumfeld hat garantiert einen Einfluss auf die Musik, bestimmt. Letztendlich geht es darum, dass man mit der Musik eine bestimmte Haltung, ein bestimmtes Gefühl wiedergibt oder kreiert. Als Student sind eher andere Dinge wichtig: Technik oder Virtuosität sind beeindruckend oder irgendwelche intellektuellen Spielchen. Aber letztendlich gibt es in der Musik immer die Ebene: was wird transportiert? Manchmal stelle ich mir vor, wenn ich Musik höre: willst du das als Soundtrack haben, wenn du jetzt die Straße entlang läufst… Dafür so ein Gespür zu bekommen ist sehr wichtig. Inwieweit spiegelt sich denn deine Suche nach einem möglichst direkten Ausdruck auch in der Aufnahme von „Madman“ wider? Mir ist bei Aufnahmen immer wichtiger, dass man die Musiker spürt und kommunizieren kann. Das ist mir wichtiger als einen perfekten Sound zu erreichen. Es ist ja oft im Studio die Diskussion: Spielen wir jetzt in getrennten Räumen mit Kopfhörern, um dann später jedes einzelne Instrument separat mischen zu können und viel Postproduktion, um einen „cleanen“ Sound zu erreichen oder sind wir alle in einem Raum und man kann nicht so viel schneiden zum Beispiel, weil überall Übersprachen passieren auf den Mikros. Wenn ich überlege, welche Aufnahmen mir Freude machen, dann sind es immer solche, auf denen spannende Musik passiert – egal ob in guter oder miserabler Qualität. Oder anders gesagt: Die Qualität der Aufnahme ist mir nicht so wichtig wie die Qualität der Musik. Bei der Platte haben wir auch alle relativ dicht gestanden und das Schlagzeug ist auf dem Saxophonmikro sehr laut, sodass im Nachhinein nicht so viel gemacht werden konnte, aber dafür konnten wir beim Aufnehmen besser kommunizieren. Wie entsteht ein Stück? Es gibt ja im Prozess des gemeinsamen Ausarbeitens deiner Kompositionen sicherlich nicht nur ein Agieren aus Stimmungen heraus, sondern auch bewusst gesetzte Stilelemente – kannst du diese genauer benennen? Mein Eindruck ist: Rhythmik spielt eine zentrale Rolle. Ja, absolut. Was mich in letzter Zeit zunehmend interessiert hat, sind rhythmische Überlagerungen, z.B. Quintolen, die über Triolen laufen oder ein Vier-Viertel-Takt, über den aber dann Gruppen von Fünf-Achteln und dann Sieben-Achteln und dann Drei-Achteln laufen oder auch Accelerandi, aber „in time“: von großen Triolen zu Achteln, zu Triolen, zu Quintolen… Diese rhythmischen Elemente, so eine rhythmische Vielschichtigkeit. Woher kommt deine Faszination dafür? Grooves und Rhythmik haben mich immer interessiert und fasziniert. Und dann gibt es wirklich konkrete Gestalten wie Petter Eldh zum Beispiel, der Bassist, der unglaublich tief eingestiegen ist in diese Welt. Aber es gibt viel Beispiele, man kann Ideen überall finden. Wenn jetzt zum Beispiel ein Groove nicht mehr triolisch unterlegt ist wie im Jazz oder auf Sechzehnteln basierend wie im Funk oft, sondern die kleinste Einheit Quintolen sind… Das findet man im Hip-Hop zum Beispiel oder auch in elektronischer Musik ganz viel..
Sind das auch konkret Quellen deiner Inspiration? Was hörst du im Moment besonders viel und gerne? Hat sich da etwas bei euch verändert als Elias Stemeseder zur Band stieß? Ich hatte den Eindruck, dass gerade sein Spiel sehr geprägt ist von Neuer Musik. Neue Musik, auf jeden Fall! Auch der zum Beispiel hat ja sehr viel mit Jim Black diese ganzen rhythmischen Dinge gemacht. Der ist auf jeden Fall auch ein Einfluss: Rhythmisch, harmonisch, melodisch, auch soundlich. Und in deinem eigenen Umfeld? Wer verdient, mehr gehört zu werden? Die meisten wahrscheinlich. Aber würdest du jemanden besonders hervorheben? Natürlich! Naja.. Olaf Rupp zum Beispiel ist ein unglaublicher Musiker. Der spielt nur frei Gitarre, viel Solo-Gitarre. Klar – und wer kennt schon Christian Lillinger oder Ronny Graupe? Wer kennt schon Elias Stemeseder? Natürlich haben die alle in der Szene und vielleicht auch europaweit einen Namen, aber letztendlich ist es ja alles lächerlich wenn man sich überlegt: wer kennt die Leute schon? Aber würdest du sagen das ist ein deutsches bzw. europäisches Phänomen? Gibt es einen Unterschied zur amerikanischen Szene? Nein, weil da gibt es auch so viele Leute. Manchmal profitieren die natürlich noch von diesem Bonus: die großen Amis kommen und spielen auf den Festivals, aber ich glaube das Verhältnis von Leuten, die bekannt werden dort wie hier: das ist überall das gleiche. Letztendlich ist es oft ein lächerliches Spiel. Man sieht es ja. Es gibt dann Leute, die werden von Major Labels, die ein Budget haben für PR, hochgepuscht eine Weile. Manchmal hat es auch eine musikalische Grundlage, oft aber nicht. Auch wer einen Artikel in den Jazzmagazinen oder auch in der normalen Presse bekommt: das ist meistens einfach Kohle oder PR. Aber es gibt eine andere Art von Bekanntheit, die Bekanntheit in der Szene. Man sagt ja auch „musicians’ musician“: viele Leute, die in der größeren öffentlichen Wahrnehmung einen Namen haben, sind in der Szene völlig unwichtig. Und umgekehrt. Der titelgebende „Madman of Naranam“ ist das Pendant zum Sisyphos aus der indischen Mythologie. Er rollt freiwillig einen Stein immer wieder den Berg hinauf, um ihn dann mit Freude wieder hinunterrollen zu sehen. Ist das vielleicht als Gleichnis zu verstehen für den Prozess der permanenten Suche und Neuerfindung deines Stils wie du mit Blick auf die vielfältigen Einflüsse beschrieben hast? Diese Gestalt hat mich irgendwie fasziniert, auch als gesellschaftskritische Figur. Die Suche nach neuen Formen ist jedoch kein Selbstzweck oder elitäre Abgrenzung, sie ist vielmehr der Neugierde geschuldet, dem Versuch einer Essenz, einer Schönheit näher zu kommen. In diesem Sinne fühle ich mich ständig, eigentlich auch jetzt so, als ob ich am Anfang bin. Es gibt immer ganz viele Dinge, die ich gerne üben möchte oder die mich interessieren, aber die Verinnerlichung passiert nicht von heute auf morgen. Das wertvollste ist, wenn man mit einer Band an den Punkt kommt, wo man vielleicht Dinge hört oder spielen können möchte, die man noch nicht spielen kann. Und dann fängt man an, es zu üben und irgendwann merkt man: das taucht auch in anderen Kontexten auf, es wird Teil von dir. Mit Hyperactive Kid war das auf jeden Fall so, einfach dadurch, dass kein Bass da war und ich oft andere Rollen einnehmen musste als vielleicht normalerweise das Saxophon einnehmen müsste. Das hat mir viele Ideen gegeben. Saxophon empfinde ich als sehr schwieriges Instrument: geschmacklich ist es ein sehr schmaler Grad und so schnell ist man der Sänger vorne. 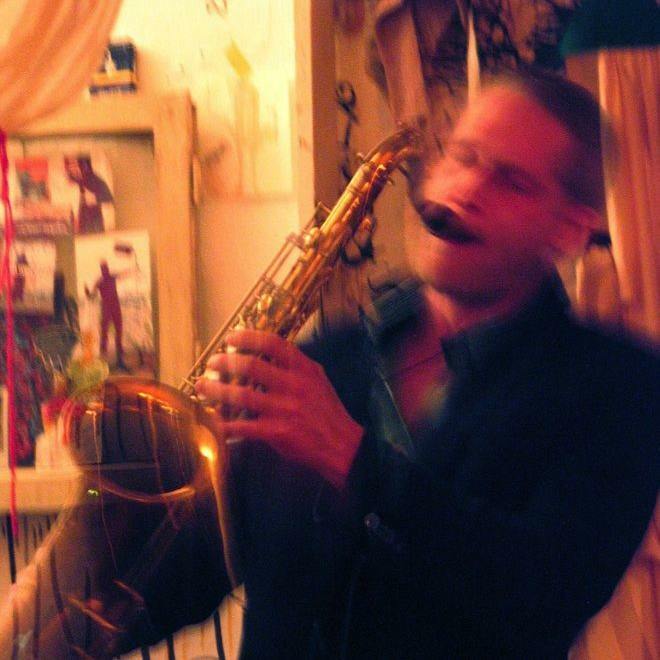 Aber wie kann man jetzt das Saxophon, so dass es nicht an Schönheit verliert, aus dieser Position herausnehmen und anders spielen? Philipp: Ja, ich bewundere zum Beispiel Frank Gratkowski und Matthias Schubert: unglaubliche Typen, was die entwickelt haben an Sounds und so. Und dann gibt es aber für mich immer eine Grenze, wo Sounds beeindruckend sind, aber man fragt sich: warum? Nicht auf die beiden bezogen, aber in Konzerten denke ich oft: „Ah, sehr beeindruckend, was man alles mit diesem Instrument machen kann“, aber mit Abstand betrachtet: „warum? Warum jetzt nicht einen Synthesizer nehmen und Windgeräusche machen?“ Aber das ist ein langer Prozess: es dauert manchmal jahrelang bis eine Technik, die man gerne im Spiel hören würde, mal aufgeht. Dann ist Philms „Madman“ Dokumentation dieses Prozesses? Eine Momentaufnahme? Letztendlich sind es meist Momentaufnahmen oder eine Dokumentation von einer bestimmten Phase, in der eine Band ist. Und dann vergeht ein Jahr bis das Album draußen ist und eigentlich denkt man: Warum kann nicht der Sound, der jetzt gerade herrscht, in einem Album festgehalten werden? Ja, stimmt. Gerade ist bei Hyper ist es extrem. Die Platten, die wir gemacht haben, sind alle nicht wirklich gut zum Anhören zu Hause. Würdest du dich selbst als Teil der freien Szene bezeichnen? Naja, es ist vielleicht auch so ein bisschen ein Missverständnis was bei Hyperactive Kid auf jeden Fall passiert und bei Philm auch manchmal: dass die Leute sagen: frei, freie Musik. Aber letztendlich sind es Stücke und die Formen sind auch oft sehr streng. Aber unser Anspruch ist eben, die so zu verinnerlichen, dass man dann frei darüber spielen kann. Und wir spielen auswendig und die Leute denken dann oft, die spielen ja frei, weil die Strukturen vielleicht nicht so greifbar sind. Ich spiele auch frei improvisierte Konzerte, aber die Bands in denen ich spiele, da ist sehr viel Komponiertes. Und wie ist dein Verhältnis zur Jazz-Tradition? Ich komme schon von der Tradition. Mit Hyper zum Beispiel haben wie die ersten Jahre Standards gespielt, nur Standards. Und dann irgendwann haben wir angefangen zu schreiben. Und dann ist es ja so: man wird als Musiker für bestimmte Dinge wahrgenommen und andere Leute fragen einen, weil sie eben das wollen in ihrer Band und dann rutscht man auch in so eine Szene. Also ich würde sehr gerne mehr Standards spielen, weil ich das liebe, diese Tradition, aber es passiert einfach nicht. What was the very first idea, musically speaking, that led you three come together as a band, that 2003? The bass player didn't show up for a jam. His space was filled by an adventurous spirit of freedom and joy. Back then we played standards like Inner Urge, Spiral or Nefertiti and the missing bass brought both freedom and a lot of responsibility to each of us. The challenge was playing music that is usually built on the bass without a bass. Also, sound-wise we had to deal with the missing warmth and unifying, connecting part of the bass. We didn't think much back then, it was simply an adventure to discover and create music together. Everybody contributed compositions and ideas and very soon we had replaced the standards with originals. No matter how complicated the music was, we always played by heart - in some rehearsals we got lost for hours in discovering endless ways to improvise over a form of maybe three or five bars. So arranging and finding ways to make the compositions happen was always a collective and time consuming process. This, to me, is a very logical workflow: everybody bringing in and suggesting very specific things the original composer could hardly know about the other players colours and possibilities on their instruments. Can you affirm that Hyperactive Kid haven’t moved away from that idea, over the years? Well, that idea is more of a spirit, an approach than a concept or a style. It stayed with us and showed many faces since the beginning. However, lot of struggling has been involved again and again mainly, because as soon as forms and chords are played things don’t work as easy without a bass. How has the group developed that idea so far? To me it still feels like only the beginning of circling around the essence of something. Somehow the direction the band takes is not even controllable. The music just changes along the way while each of us is trying to grow as a musician. The development and phases of some songs we played for years could maybe serve as an image for this bigger, longtime development of a band sound. Also during the past 12 years we’ve shared so many strong and overwhelming experiences while traveling all over the world and as friends, which to some extent somehow creates a common understanding of music on another level. That definitely has an impact on the sound and the atmosphere on stage. Both Christian and Ronny are some of the most dedicated musicians I've ever met. Their love of music is as big as the universe. Each of them has a very defined and own vision of how their instruments should sound and of which - maybe at times surprising - role it could play. Sometimes it seems to me they want their instruments to sound like a whole orchestra- reaching for something out there that might be possible to play... Also their crazy technique and understanding of musical parameters gives both the necessary overview and thereby freedom to tell their stories in many different, even very tricky contexts. A big impact on the band sound is their love for the pure way of playing their instruments... to some kind of extrem approach: for example rather imitating an echo than using effects on guitar etc. What do I bring to the band? In this trio I hardly ever have a break from playing. Switching roles from soloing to accompanying to creating a texture or sound with the others etc. It is a big challenge to find ways on the tenor to play all these rolls. It also is kind of expected or demanded by the colleagues to surprise and entertain each other especially in songs that have been played over and over again. Being the very different characters all three of us are also creates some - most of the times - positive tension. On the cover of your first album, “Hyperactive Kid”, a trumpet is depicted: anyone in the trio plays it? It is my twin brother Jan's trumpet. He also placed the plastic sword there. For no specific reason. None of us would dare to even touch such a difficult instrument as a trumpet! Each one of you guys has his own projects or plays as a sideman in others’ bands:how much of these experiences comes into Hyperactive Kid? All of them. And on the long run I think it will help us come closer to the real sound of the band, and accept its own weird beauty as we don't have to create all the music we imagine with that one band. For a long time i thought the other way round: being mainly involved in that one band would force us to dig deeper as we wanted to tell all the stories within that frame. In Fusk you play alongside Rudi Mahall, a master of bass clarinet: have you had any opportunity to “steal” some of his secrets (all’n’all you both play “reeds”)? Haha, yes, definitely. We played many tours and traveled a lot, listened to tons of cd’s in the car - enough time and opportunities to steal. For a year or so i even played his bass clarinet reeds on the tenor- the ones that didn't work for him - talking of "reeds" - hoping for more! His musical clarity, groove, sound and beauty is overwhelming. I've loved every single note that I have heard him play. A miracle! The thing that impressed me most is his joy of creating sound - every morning in every hotel he couldn't wait to start practicing. I've met nobody so far who comes even close to playing the bass clarinet like him with that sound. So it is more the approach than details we talked about or i might have "stolen". Also - but it will take years to evolve in my playing - listening to Rudi gave me an idea of how to approach the flagolet - register. This is difficult to explain... also for example listening to Peter Evans playing trumpet up there gives me an idea of how i want to sound up there on the tenor. Rudi playing the bass clarinet like an alto. Searching for something very specific and unexpected or in other words: the imagination being stronger and more defining than the instrument itself. To me, weirdly nobody else comes closer to create the mood Charlie Parker must have created than Rudi. What can you tell about the Berlin JazzKollektiv and your experience in that? Is Hyperactive Kid involved in too? Ronny and me. But Christian definitely lets us know what he likes or doesn't like about JKB. What are your (HypKid’s) links with European free “movement”? Which great musicians of this scene do you look at? It’s very often the colleagues surrounding us we look at. Also constantly new characters are showing up... in all the european countries. The diversity is crazy... Of course too many of them you don't see playing the big festivals nor encounter them in the ad-based magazines. Luckily Berlin, where all of us are based, changed the way it did and many fantastic musicians from all over moved here or stop by from time to time or play. American jazz musicians see their tradition in swing orchestras, Parker, Dizzy, improvisation, Coltrane, Miles, licks, Max Roach, Ornette Coleman, free (...) and so on: what do you consider “tradition”? Growing up in a country that doesn't really have folk music which is present and lively anymore I think all of us have our own roots: depending on what they grew up listening to and play along with or heard in concerts etc. With the WWW entering our lives, this process of individualized roots became normality. And apart from that, by now there are so many coexisting jazztraditions - one has to choose a point where to enter, how far to go back. The more of a tradition one knows, the better, but it can also be a trap: you can never reproduce any jazztradition or style and reach up to it simply because you will never feel the same excitement and fire the inventors felt, everything had its place and time. So besides being aware of the exploding richness and the whole history of Jazz (all the countless jazztraditions) and maybe knowing how to play some of it, I think it is mainly about finding some field or language for oneself. I am deeply connected to tradition and constantly try to understand and carry forth its liveliness and fire - which could only develop in the context of its time ; and thus secure the old masters their lasting impact." Hyperactive Kid is mainly an electro-acoustic trio: any electronic “intrusion” (delays, loops, harmonizer, other devices) in the future of Hyperactive Kid? Effects were Ronny’s job so far - he didn’t use them much until now. The music felt more alive that way. We almost never used a loop station for example. Somehow this is the hard way, as it is so easy to create a big atmosphere by using effects etc. 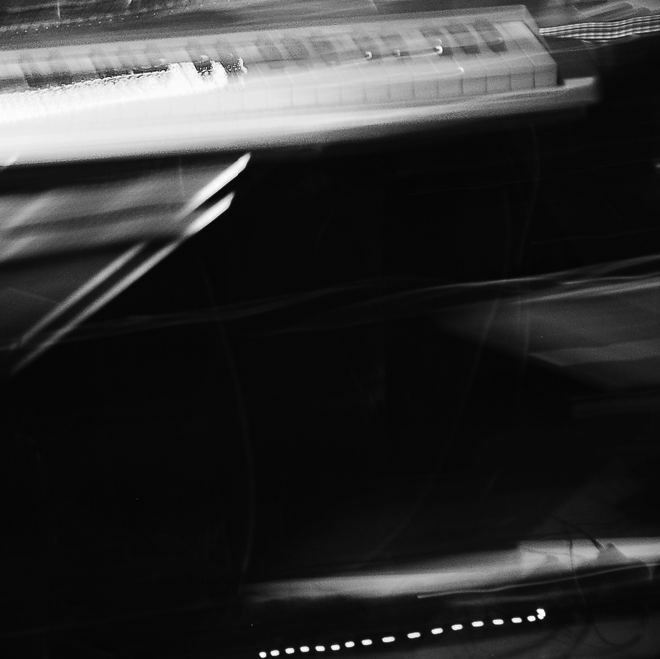 But soon, hopefully 2015 we want to produce a proper studio album, playing with all the possibilities of editing etc. This opposing the latest two Hyper albums which are live recordings. And if Hyperactive Kid features a special guest (just only one), who would this be? We never missed a gig and never played with a sub or guest so far. Tough one. No idea. Any suggestions? Many are the jazz adventurers who have run aground on the rocky shoals of the Thelonious Monk sound. They either come off as gimmicky impersonators, the portrait of studied eccentricity, or as well-meaning but genuinely confused – unsure of what to do with all of that dissonance. Philipp Gropper’s Philm gets it just right on Licht. 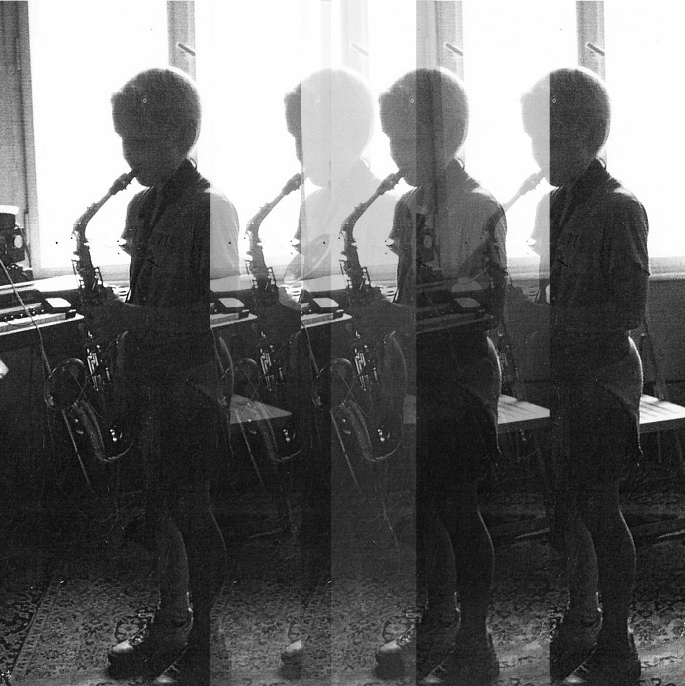 Gropper begins with “Synthesizer,” accompanying himself on saxophone through an angular double-tracked journey. When drummer Oliver Steidle joins in, it’s with an off-kilter abandon. 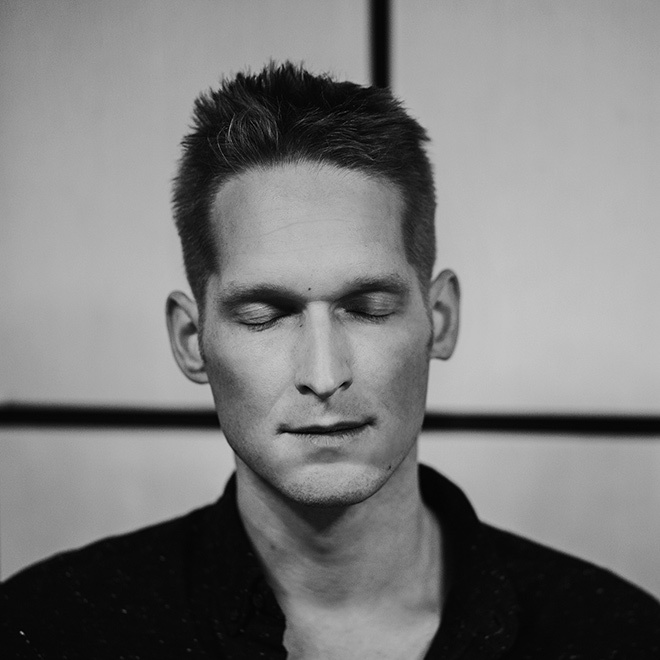 Pianist Havard Wiik and bassist Andreas Lang echo Gropper’s sense lateral improvisational wonder, before Wiik steps forward with a series of unorthodox runs. Gropper’s return is, at first, like a moment of guttural consternation, before he begins working inside the folds of the displaced rhythms all around him. Wiik couples then decouples, and Gropper sounds – if only for a moment – like a lonely romantic. But, just then, Steidle brings his kit back to a rolling boil, and Gropper returns to his initial harmonic distortion as the track concludes. The album’s title track charges in with a thrumming sense of urgency, instantly identifiable as having come from the Monk tradition – but at the same time restlessly allusive on its own. After Gropper scales and then descends, then scales and descends – sounding just like a sudden bolt of fear – “Licht” ultimately settles into a more conventional, if still eye-poppingly dynamic, propulsion. Cleverly arranged, this sounds more like “jazz,” but yet is remains enormously imaginative. Gropper’s solo is a fleet, chest-pounding romp, pushed along by Steidle’s insistent retorts. “2-22” begins as another daring contretemps between Gropper and Wiik, and as they tangle, Steidle adds a stunning cacophony behind them. The results are among Licht’s most tension-filled passages. 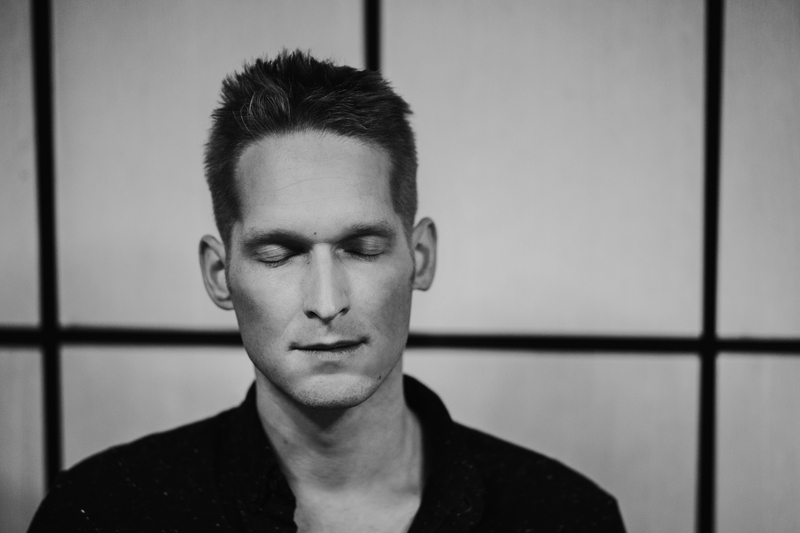 When Wiik initially comes to the fore, he plays with a pent-up abandon – spurring Gropper into a more contemplative tack. Suddenly, the sax isn’t emitting sheets of sound so much as these curly-cues of smoke. Lang and Steidle slow to an intermittent shamble, as Gropper offers a frankly gorgeous meditation. By the end, though, as Wiik returns, Gropper can’t help but push his horn to its outer limits once more – and there, through that slurring and grating, he’s inverting your expectations once again. “Robot” sounds like a funky R&B tune that’s been cut up into pieces, catching what sounds – for a beat or two – like a grease-popping groove, only to stop dead. Then they start again, with Gropper honking happily along. Next, there’s stony silence. Then, it begins again. It’s a wholly authoritative performance from the rhythm section, which had to approximate something very similar to stop-and-go traffic on their instruments. “Club 49,” on the other hand, begins with a weirdly transfixing ambient hum courtesy of Gropper, whose exhalations hang over this equally ominous piano figure. Lang and Steidle softly clang about, soon joined by Wiik, as Gropper continues along with his lengthy ruminations. Slowly, almost imperceptively at first, the composition begins to pick up steam, until finally the quartet has rejoined its earlier sense of dissonant abandon. “Epilog” restates the album’s debt to Monk, in that it’s utterly oblique at first, but then Philipp Gropper’s Philm quickly reclaims its own frisky sense of originality for a final brilliant charge: Gropper offers a brawny sequence of shrieks and scronks, even as Wiik makes these dashing runs. As with so many moments of this album, the track reveals new treasures on repeating listens. Later, I became transfixed as Lang and Steidle answered back with these ruggedly individualistic splashes of color – all while keeping this adroit cadence. It’s that kind of album, better each time you listen. Begeisterte Linernotes für ihre dritte CD schrieb kein Geringerer als Joachim Kühn. „Eine Superplatte“, war das Fazit von einem der Väter des modernen deutschen Jazz. „Diese drei Musiker spielen auf höchstem Niveau des Jazz. Alle ausgestattet mit großer Musikalität und Instrumentenbehandlung und einer Vision vom Sound, von Komposition und Improvisation. Das ist Musik von heute.“ So leitete er sein Urteil her. In der Tat ist das Trio Hyperactive Kid mit Schlagzeuger Christian Lillinger, Gitarrist Ronny Graupe und Saxofonist Philipp Gropper eine der eigenständigsten und spannendsten Bands des jungen europäischen Jazz. Überdies verblüfft Gropper gerade mit der Debüt-CD seiner zweiten Band Philm und hat zudem noch sehr konkrete Pläne für eine dritte. Gründe genug, für ein paar Nachfragen. Ausgeruht, konzentriert und recht zufrieden sitzt er nach einem Gastauftritt in Pablo Helds Großformation „Glow“ während der 36. Leipziger Jazztage in der Hotellobby. Ganz unbedingt ist Philipp Gropper ein Berliner. 1978 wurde er als Sohn musikbegeisterter Eltern auf der Westberliner Insel geboren. Hier ist er geblieben, erst recht nach dem Fall der Mauer. Als die noch fest die Metropole teilte, wollte der Vater im Westteil der Stadt dem Wehrdienst entkommen, fand seine Frau und ging nicht mehr weg. Hobbymusiker waren beide, sie spielt Tenorsaxofon, er Trompete. Die Wohnung war angefüllt mit Musik und tatsächlich wurde irgendwann eine Charlie-Parker-Platte zur Initialzündung. Philipp und sein Zwillingsbruder Jan – Trompeter und heute auch Profimusiker – wurden nicht getrimmt zu Musikern, sondern fingen selbst Feuer, weil viel Musik einfach immer da war. Genug Anregung gab es und auf solcher Basis erschlossen sich die Brüder gemeinsam eine Welt der Klänge. Sie vertieften sich in einzelne Musiker, standen mit Kopfhörern in Musikläden, zeigten sich dies und das. Das Zentrum bildete vom Beginn an vor allem der Jazz. Eine logische Konsequenz war später das Musikstudium. Zunächst aber war da die Musikschule Charlottenburg. Ihre Lehrer Christoph Griese und Jörg Miegel sorgten dort dafür, dass die Kinder sehr früh schon in Bands spielten und regelmäßige Jobs als Zirkusmusiker oder bei Straßenfesten hatten. Philipp lernte Altsaxofon, um mit 16 dann aufs Tenor umzusteigen. Es ist bis heute, ergänzt um das Sopransaxofon, sein Hauptinstrument geblieben. Er machte das Abitur, bildete sich autodidaktisch im Selbststudium auf seinem Instrument weiter und absolvierte seinen Zivildienst. Während dieser Zeit spielte er mit Eric Schäfer, Oliver Potratz, Daniel Stawinsky und seinem Bruder immer montags in Franz de Byls altem Club Flöz für Freigetränke zur Sessioneinleitung Standards. Die Aufnahmeprüfung an der Universität der Künste verlief problemlos. Berlin blieb Berlin, selbst dann, als ihm ein Gitarrist, mit dem er Straßenmusik gemacht hatte und der dann nach Berkeley gegangen war, zu einem Vorspiel bei einem der Scouts der dortigen School of Music verholfen hatte. Philipp Gropper hat das daraus resultierende satte Stipendium nicht angenommen und zog Berlin vor. Und irgendwie folgt diese feste Verwurzelung in seiner Heimatstadt einer inneren Logik seiner Biografie. Längst kommt die Szene nach Berlin und Gropper trifft sich mit Spielpartnern aus diversen Ländern. Berlin ist schnell, bunt, international, vergleichsweise billig und immer in Bewegung. Berlin ist eine gute Schule. Institutionalisierte Schulen hingegen implizieren stets auch die Gefahr, ihre Schüler zum Erfüllen des Abverlangten zu erziehen. So wird man Klassenbester, löst sich aber auch vom eigentlichen Faszinosum der Musik, nämlich Dinge sehr direkt ausdrücken zu können bzw. überhaupt zu spüren, was man sagen will. Philipp Gropper geht es stets darum, seine eigenen Fähigkeiten zu finden „und daraus sein Universum zu basteln“. Doch die Tradition ist für ihn vor allem ein Scharnier in die Gegenwart. Man ahnt die Wurzeln, doch das darf nicht genügen. „Musik lernen ist wie eine Sprache zu lernen. Man lernt verschiedene Vokabeln und die Grammatik, sammelt, bis man die Möglichkeit hat, sich auszudrücken. Je mehr Vokabeln man hat, umso differenzierter lässt sich formulieren. Dann geht es darum, die Bausteine geschmackvoll einzusetzen und passend.“ Im richtigen Moment ist das Richtige aus der Schublade zu ziehen. Bis man frei über die Elemente verfügen kann, ist es ein langer Weg. „Bestimmte Dinge gefallen mir und daran arbeite ich dann, bis ich sie spontan abrufen kann, um mit ihnen zu improvisieren, mit ihnen zu spielen im Wortsinne.“ Allerdings darf das dann nicht wie Versatzstücke klingen, sondern muss eingebunden sein in die Sache der Band, in der die klassischen Rollenverteilungen aufgehoben sind. Gleichberechtigt wird kompakt ein extremes Tempo angeschlagen. Die Kompositionen sind meist zwei bis vier Seiten lang und dauern live dann um die 20 Minuten. „Je tiefer man in eine Idee eintaucht, umso mehr kann man auch herausholen. Auch nach zehn Jahren gehen so immer noch Türen auf. Jeder von uns bewegt sich auch in anderen musikalischen Kontexten, lernt und speist das ein.“ Das ergibt im Idealfall Konzerte, die den Eindruck vermitteln, es könne in dieser unbedingten Kurzweil immer so weitergehen, Konzerte als sinnliche Ereignisse für faszinierte Zuhörer, oft auch solche, die mit dem freieren Jazz kaum Hörerfahrungen haben. Die Plausibilität dieser Auftritte hat etwas Bezwingendes. „Grundsätzlich aber ist es ein Mysterium, wann ein Gig abhebt“, grübelt Philipp Gropper. Er transformiert den Puls von Berlin als Ganzem und Kreuzberg im Besonderen in seine Kunst, die den Strudel der Zeit abbildet. Überall neue Orte, an denen Jazz passiert, überall kontinuierliche Veränderung. „Ich reise gerne und habe das Glück, national und international eingeladen zu sein. Doch ich komme gerne nach Berlin zurück. Reisen bringen viel Inspiration und relativieren alles, was man zuhause vorfindet.“ Daheim dann jagt er diese Eindrücke durch seine Kopfmaschine. Auch andere Künste, oft durch Freunde vermittelt, sind wichtige Quellen der Anregung. Immer steht die Musik auch im Kontext zu ihrer Zeit. Die Musik sollte sich allerdings zunächst einmal selbst genügen und aus der Liebe zu den Klängen wachsen, nur dann entdeckt man etwas. Jedoch kommt noch eine Menge Intensität hinzu, wenn starke Musiker sich in politische Kontexte begeben.“ So entwirft Philipp Gropper seine Musik als eine Musik des Jetzt, nicht als nostalgische Wiedergängerei. Die Geschichte seiner Musik hat er als inhaliertes Destillat in sich. Und wie sind seine Empfindungen zur Krise der CD? Wenn alles für alle billig bis kostenlos zugänglich ist, untergräbt das allzu oft die gründliche Beschäftigung damit. Das Denken in langen Bögen geht verloren, Konzentrationsfähigkeit und Aufmerksamkeit bleiben untrainiert. „Konzerte sind da ein probates Gegengift, das von den Medien und von noch so raffinierter Unterhaltungselektronik niemals ersetzt werden kann. Konzerte sind für mich das Direkteste und Wundervollste, deswegen bin ich nicht allzu besorgt über diese Entwicklung.“ Konzerte sind wie Refugien, wie Konzentrationsoasen, wo die Leute bei einer Sache bleiben, wo das Denken und die Erfahrung, sich wirklich auf etwas einzulassen, in langen Bögen stattfindet. Das Leben ist ja auch in unserer vermeintlichen Tempogesellschaft nicht wirklich so schnell, wie uns allenthalben suggeriert wird. Auch das ist eine Funktion von Kunst, über die mehr reflektiert werden sollte. Ein Musikliebhaber muss verweilen, eintauchen, er kann sich nicht durchzappen. Tatsächlich: Dies ist die erste CD Philipp Gropper’s unter eigenem Namen. Dabei zählt der Berliner Saxofonist lange schon nicht nur hierzulande zu den bemerkenswertesten und eigenständigsten neuen Stimmen seines Fachs, nicht nur im grandiosen Trio Hyperactive Kid. Weder inflationiert er sich, noch will er sich vordergründig anbiedern. Die Jazzgeschichte hat er verinnerlicht, immer wieder funkeln Spurenelemente seiner Altvorderen durch seine unvorhersehbaren Improvisationslinien. Doch ist das Verblüffendste an diesem verblüffendem akustischen Quartettalbum mit Pianist Håvard Wiik, Bassist Andreas Lang und Schlagzeuger Oliver Steidle, wie abgeklärt und doch spontan, wie eigenständig und in sich logisch die sechs vertrackten Stücke des Bandleaders daherkommen. (...) ein umwerfend unverkennbar "eigenständiger", sofort von seinen Kollegen unterscheidbarer Gropper. Hyperactive Kid, die populärste Avantgarde-Band der Stadt. Ende März im Berliner Programm-Kino Babylon. (...) Auf dem Plan standen Ravi Coltrane mit seinem Quartett, Don Byron mit seinem neuen Gospel-Outlet und als verbindendes Glied in der Lounge die Berliner Band Hyperactive Kid. (...) Die großen Gewinner des Abends waren Hyperactive Kid. Das Publikum war wegen der großen Stars aus New York gekommen und trug eine Berliner Band im Ohr nach Hause. Hyperactive Kid hatten keine Ahnung dass sie die Retter des Abends waren. Doch sie traten mit einer Leidenschaft und kreativen Power in Aktion, als wäre es der letzte Abend ihrer Laufbahn. Diese Performance machte Spaß, denn sie hatte etwas mit der Wirklichkeit zu tun, der jede einzelne Besucher an diesem Tag irgendwo in Berlin begegnet war. Saxofonist Philipp Gropper, Gitarrist Ronny Graupe und Drummer Christian Lillinger spieleten nicht für ihre eigene Gefolgschaft und rissen die Leute trotzdem aus ihrer Pausen-Lethargie. Urbane Beiläufigkeit und individuelle Intensität ergaben genau jene Liaison, die Berlin so lange gefehlt hatte. Vielleicht war man aber auch bloß schon zu sehr verwöhnt vom Auftritt der ersten Band dieses Abends, Hyperactive Kid. Was sich ein wenig nach trendiger Teeniegroup anhört, ist in Wahrheit eine der innovativsten und brillantesten Formationen des zeitgenössischen Jazz. Das basslose Trio mit dem Gitarristen Ronny Graupe, dem Saxofonisten Philipp Gropper und Christian Lillinger am Schlagzeug behauptet - anders als (...) - nicht bloß, neue Wege zu gehen. Auch die drei Berliner arbeiten mit musikalischer Dekonstruktion, doch ihre Ansatz geht weitaus tiefer, indem sie nicht nur mit Haltungen spielen, sondern an die Substanz der Musik selbst gehen. Zeitstrukturen werden hier mittels raffinierter kompositorischer Verfahren auf den Kopf gestellt, Improvisationen nehmen Anlauf und stocken, beißen sich fest in einem Akkord, finden einen anderen Weg. Töne und Geräusche werden verflochten wie in der neuen Musik, bekannte Muster leuchten kurz auf, vieles klingt bekannt und ist doch ganz anders. Die atemberaubende technische Virtuosität der drei Musiker, die ihr Jazzeinmaleins allesamt verinnerlicht haben, geht dabei völlig auf in einer Dichte des Zusammenspiels, wie man sie nur von wenig langjährig bestehenden Formationen kennt. Schön jedenfalls, dass die Stuttgarter Opus GmbH, die alljährlich im Sommer die Jazz open veranstaltet, dieses kleine Festival dazu genutzt hat, auch mal Bands einzuladen, die jenseits des Mainstream schwimmen. Wenn man sie im Konzert sieht, scheint die Herkunft ihres Namens klar. Christian Lillinger, der vierundzwanzig Jahre alte Schlagzeuger von Hyperactive Kid, spielt so, wie das Trio heißt. Hinter seinem Instrument scheint er gar nicht wirklich sitzen zu wollen, ständig ist er in Bewegung. In aberwitzigem Tempo und manchmal mit weit aufgerissenem Mund trommelt er auf alle Bestandteile seines Sets ein, bis sie ihm nicht mehr reichen und er nach etwas in der Nähe greift - Handpercussions, Aschenbecher, alles recht. Christian Lillingers Mitstreiter, der Saxofonist Philipp Gropper und der Gitarrist Ronny Graupe, wirken im Vergleich dazu auf der Bühne fast stoisch. Auch im Gespräch bleibt es bei dieser Rollenverteilung. Philipp und Ronny sind ruhig und gelassen, Christian ist nur unwesentlich weniger quirlig als an seinem Instrument. Zu ihrem Namen kam die Band, deren aktuelles Album "3" gerade erschienen ist, eher zufällig. "Es gab einen Auftritt, da wurden wir spontan vom Clubbesitzer ,Uncle Ron, Mister Hip and the Hyperactive Kid' genannt", erinnert sich Philipp Gropper. Bei einem Festival musste dann schließlich ein Name für das Plakat her. "Da haben wir dann als Arbeitstitel ,Hyperactive Kid' genommen, denn wir drei bilden sozusagen ein pulsierendes Ding", so Christian Lillinger. "Wir sind eins, wir versuchen im Sound so zu verschmelzen wie eine Person." Tatsächlich klingt die Musik des Trios Hyperactive Kid auf seltsame Weise geschlossen. Oft scheinen sich die drei Musiker in völlig unterschiedliche Richtungen zu katapultieren, sodass man meint, die Struktur ginge koppheister. Doch von einem Augenblick zum nächsten kippt die Stimmung, und sie spielen fast so homogen wie eine Popband. Für eine experimentelle Jazz-Combo sind ihre Stücke sogar äußerst strukturiert, zur Hälfte ist die Musik formstreng wie in der modernen Klassik durchkomponiert. "Es ist eigentlich alles total organisiert", so Ronny Graupe. "Es ist sehr flexibel, je nachdem, wie lange die Improvisationsstellen sind. Aber die geschriebenen Teile bleiben mehr oder minder gleich." Die Stücke komponiert jeder zunächst einzeln für sich, dann erst werden sie gemeinsam erarbeitet, wird das ein oder andere ausprobiert. Manches entsteht auch "naiv", wie Lillinger es nennt: "Es gibt Dinge, die einfach krank sind, die man eigentlich nicht so macht, weil man es als lächerlich empfindet. Gemeinsam kann man dann in diese Komposition eine Ästhetik reinsetzen. So etwas entsteht durch Zusammenarbeit." Diesen Prozess beschreibt Philipp Gropper als durchaus zielgerichtet: "Wir versuchen, so an den Stücken zu arbeiten, dass jedes Stück für sich eine eigene Welt mit eigenen Gesetzmäßigkeiten ist." Die Musik ist zum einen völlig heterogen, "eine Schizophrenie mit mehreren Stilistiken drin", so Lillinger, andererseits kompakter Pop, fast wie ein Song, "wo man eine richtige Melodie erkennt". Ein schönes Beispiel ist Groppers Stück "Rocker Tilo" vom neuen Album. Nach einem rasend schnellen abstrakten Saxofonsolo in der Mitte steigert sich das Stück in einen schlingernden Groove, der sich immer wieder selbst in den Weg zu geraten scheint. Auf dem Höhepunkt singen plötzlich Lillinger und Graupe als Chor zur Saxofonstimme - mit ziemlich schrägen Tönen, wie man in der kurzen A-cappella-Einlage hört. Der Wille zum Experiment ergibt sich nicht zuletzt aus der ungewöhnlichen Besetzung, denn eigentlich fehlt das Fundament: "In den traditionelleren Besetzungen gibt es immer einen Bass, der trägt harmonisch total viel. Diese Säule ist jetzt weg, und die Last verteilt sich auf jeden von uns. Deswegen müssen alle stärker an einem Strang ziehen", beschreibt Graupe die Konstellation. Geplant war das Wagnis nicht. Die Besetzung ergab sich bei einer Session, zu der sie mit einem Bassisten verabredet waren, der einfach nicht auftauchte. Angefangen haben sie dann ganz traditionell, mit Standards. Die studierten Jazzmusiker hatten zuvor alle im Bundesjazzorchester bei Peter Herbolzheimer gespielt, Gropper und Graupe lernten sich dort kennen. Zum Jazz kommt man als vergleichsweise junger Musiker heute auf ganz unterschiedliche Weise. Bei Gropper und Graupe waren es die Eltern, die Jazz hörten, Lillinger gestattete sich die pubertäre Revolte gegen den rockorientierten Vater mit Free Jazz. Die Erfahrung, dass es nicht cool war, Jazz zu hören, machten alle drei. Furchtbar viel hat sich daran nicht geändert. Jazz aus Deutschland, zumal experimenteller, wird weitgehend unter Ausschluss der Öffentlichkeit praktiziert. In Ost wie West gibt es zwar eine Reihe prominenter Free-Jazz-Pioniere wie Peter Brötzmann oder den Schlagzeuger Günter "Baby" Sommer, bei dem Lillinger studierte, aber Musiker der jüngeren Generation machen in Deutschland erst seit einigen Jahren wieder verstärkt auf sich aufmerksam. Zum Teil habe das mit der verbesserten Ausbildung zu tun, vermutet Graupe. Vor zwanzig, dreißig Jahren gab es in weitaus weniger Städten die Möglichkeit, Jazz zu studieren. Dass es eine lebendige Jazzszene in Deutschland gibt, haben inzwischen auch die Musiker aus anderen Ländern gemerkt: "Wir merken, dass viele Musiker von überall her nach Berlin ziehen, egal ob aus Italien, Skandinavien, England oder Frankreich", so Phillip Gropper. Bleibt zu hoffen, dass der experimentelle Jazz sein Experten-Vollbart-Image mehr und mehr ablegt, denn die Hörer, denen die Musik von Hyperactive Kid gefällt, sind nicht selten eher jazzfern, wie Gropper feststellt: "Wenn Publikum kommt, das eigentlich kein Jazzpublikum ist, haben die oft genug einen Zugang dazu. Eigentlich geht es häufig nur darum, die Leute überhaupt zu einem Konzert zu bringen." Das Gleiche kann man ihrem wunderbaren neuen Album wünschen, laut dem legendären Jazz-Pianisten Joachim Kühn "eine Superplatte". Eben. Griese nennt stolz die heute zwanzigjaehrigen Zwillingsbrueder Jan und Philipp Gropper als Berlins Jazzzukunft.